Public school accountability is a standard practice for North Carolina going back to the early 1990s. The North Carolina School Report Cards provide parents with information on such key issues as student performance, teacher experience, and school safety. Data are provided at the school, district, and state levels to enable parents to compare the performance of their student’s school with others across the district and state. Legislation (G.S. §115C-83.15) passed during the 2013 long session of the North Carolina General Assembly provides an additional measure of school performance in the form of School Performance Grades. Beginning with the 2013–14 school year, the annual North Carolina School Report Cards display a letter grade of A, B, C, D or F for each school in the state. 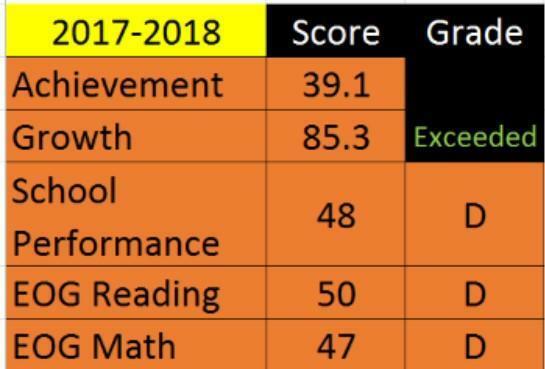 The School Performance Grades are based 80 percent on our school’s achievement score (student proficiency) and 20 percent on students’ academic growth. It is based on how well the students performed in Reading for grades 3rd-8th, Math for grades 3rd-8th and Science for 5th grade and 8th grade. One of our top priorities are to improve our School Performance Grade. There are a number of key programs we have in place to help improve student performance to ensure Charlotte Choice Charter will be one of the best Charter Schools in the Nation. 50% of new staff including teachers, secretaries and teacher assistants. Strong S.T.E.M. focus in Science, Technology, Engineering and Math. High Academic Expectations for ALL Students-No Excuses when it comes to teaching and learning. We hope you will closely follow your student’s academic progress and work with his or her teacher(s) to help ensure they stay on track academically. Working together as a team, we can improve not only how well our students are performing individually, but how our school is performing as a whole. There is nothing more important to administrators and teachers at Charlotte Choice Charter than ensuring that students are ready for the next step in their academic career. I look forward to working with you to make sure your student is on track for success.